Situated on the edge of Grand Teton National Park, this spacious log home offers breathtaking views of the Teton Mountain Range and local wildlife. Whether you’re enjoying all that summer has to offer, or looking for the best snow in the West, this is the perfect home base for your Jackson Hole vacation. Perfectly appointed with Western charm, this unforgettable property celebrates its mountain setting. Vaulted ceilings and expansive windows fill the home with natural light, and showcase the stunning vista. Leather furniture, stone fireplace, handmade knotty pine finishes and Western antiques lend this space an ambiance of true mountain comfort. Unwind after a day of adventure in the outdoor hot tub or master sauna, or kick back and take in the view from the deck or yard. An excellent option for couples or families, this property has it all; a great location, plenty of conveniences, and sophisticated Western flair. We loved this home. The views were spectacular and Apex was attentive. Quite close to the airport, which we actually enjoyed because our teen is learning to fly. But, if you are sensitive to jet noise, you might find it distracting. Family of 6 spent the 2017 solar eclipse based at this wonderful home. Proximity to airport was considered, but ended up not being an issue. The location can't be close to everything south and everything north! Can't wait to return! We look forward to seeing you next summer, Maggie! One of our favorite vacations! We so enjoyed this home, it fit our family of 4 perfectly. After spending 6 days in the area, we are convinced this home has the best location and views for it's size and price. Though there are a few other homes in the line of sight, the living room views of the Tetons are breathtaking, we especially loved sunrise and sunset. The house had high-end amenities, nice furnishings, wonderful log home touches in every room, and a great wood burning fireplace. Overall it was more beautiful than pictured in the listing. Our family loved the bikes in the garage, and enjoyed pedaling around this neighborhood at the base of the Tetons. Surprisingly the airport nearby was not really an issue, but you should know it's there. Lastly, we saw moose, elk and many deer on the property, as well as in the nearby Ntnl parks. We will definitely come back. My family recently stayed at this home for a weeklong vacation, and it was the perfect property for us. The home is situated between the town of Jackson and Grand Teton National Park, making it an ideal location for those interested in exploring all that Jackson Hole offers. 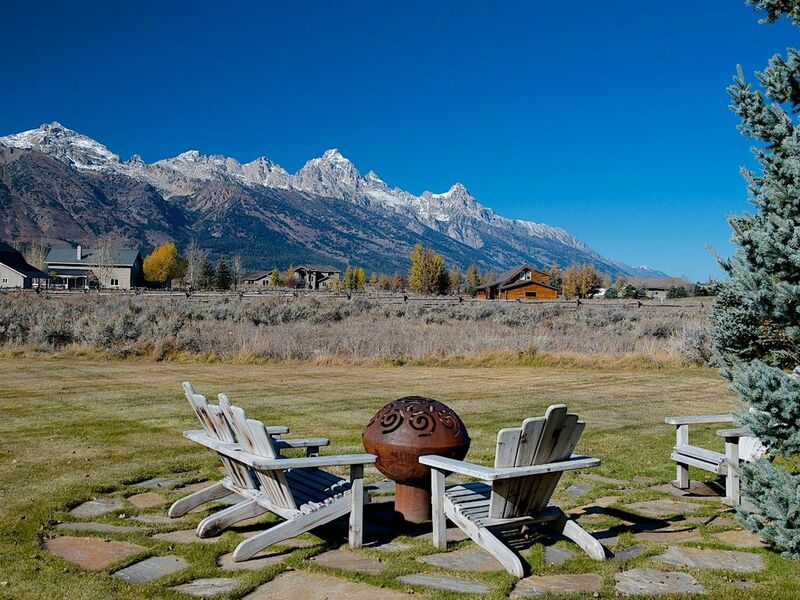 The home itself is immaculately furnished, and offers breathtaking views of the Grand Tetons. The bedrooms are large, the bathrooms are pristine, and the kitchen and common spaces are desirable for large or small parties. There is also a sauna in the master suite bathroom and an outdoor hot tub. Plus, the homeowners have stocked the garage with bikes, rafts, and other amenities for outdoors use. In short, it has everything you need for a memorable trip. This house is amazing! It is elegant and homey at the same time! Best of all it has a MILLION DOLLAR view of the front range of the Tetons and you can sit in the living room or on the deck and feel all your tensions melt away! The owners have thought of everything: a hot tub; a fire pit with great chairs; hammocks; and a beautiful fireplace in the great room. There is everything you need to cook a wonderful meal and spaces to gather and to "get away" (a den in the back of the house to read, watch movies or rest). The dining area has views as well and we spent many an evening watching the sunset over the mountains. The house was clean and decorated in very tastefully. The lawn was cut and the outdoor space landscaped and lovely. The property is minutes away from the park and we loved our drives to see buffalo, elk, BEAR, moose and deer. We hiked, biked the flat roads around the property, golfed and just "hung out." This is the place to do it! We will be back! What a great place to vacation! We would give this our highest recommendation! My wife and I absolutely love this house and location. After staying at the Snake River lodge one year we decided to try something different and stumbled upon this gem. The house sits on an acre of land sandwiched bewteen two national forests with a fantastic view of the Tetons. The house is immaculately kept and offers exquisite amenities including heated floors, a sauna, a full gourmet kitchen and plenty of room for families. On our most recent visit we had a flock of elk come through the backyard and it was just amazing to watch. You feel completely at peace amid all the natural beauty and comforts of the house, and town is a short 10min drive. We cant decide whether we like the summer or winter better. The private hot tub overlooking the tetons is an especially appealling aspect, as is the master bedroom which has its own floor. An absolute must stay, and a welcome reprieve from the hustle and crowdedness of Jackson Hole. Our two year old loved running in the huge grassy backyard, and watching the neighbor's horses. This property will serve as the perfect base camp for all of the activities one visits Jackson Hole for. With a short drive to the southern entrance to the Grand Teton National Park, visitors can take in the grandeur of the majestic Teton Range. Very close proximity to popular trails heads, ferry rides, camping, picnic spots and rock climbs. Also, close to Moose WY which house the Visitor Center for the Park, Outfitters for Fly Fishing and scenic Cruises on the Snake River. Short drive to the town of Jackson for all town amenities, shopping, dining, fireworks, Snow King recreational area for mountain biking. Near Jackson Hole Mountain Resort for Aerial Tram rides to top of Jackson Hole Ski area 10,450 ft., hiking, biking. Near National Forest and the Kelly area for hunting, fishing, lakes and historical sites, just a few miles drive to Antelope Flats and National Elk Refugee for wildlife viewing of bison, elk herds as well as antelope, moose, eagles, and a wide variety of wildlife. *30 day minimum stay requirements per town code, please email or call for details. Additional fees may apply, pricing subject to change until booking is confirmed.